Upon arrival in Yangon International Airport by morning flight, our guide will welcome you at the airport and transfer you to the hotel. After hotel check-in and refreshment, start of the city tour in Yangon including Sule Pagoda (Land Mark in city center). It is said that it is 2,000 years old and the central stupa enshrines a hair of Buddha. 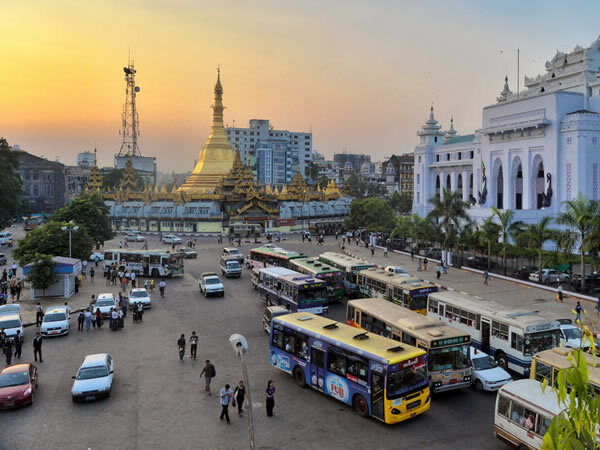 At every corner around Sule Pagoda you will discover the unique charm of Yangon with its old colonial architectural buildings such as City Hall, High Court, etc. In the evening, you will be a great sunset at the marvelous Shwedagon Pagoda and its pagoda bazaar. The massive and magnificent gold-encrusted Shwedagon Pagoda (100 meter high) is one of the wonders of the world. It was built 2500 years ago and enshrined with hair relics of Buddha and a place where to meet devoted Buddhists meditating and praying. Breakfast at the hotel. Today is a free day and you can enjoy your leisure activities of your choice (no services provided). After breakfast at the hotel in the early morning, you will depart by car and driving to Kyaikhtiyo (114 km, 5 hours). On the way Bago pagoda tour: Shwemawdaw Pagoda, stands as a landmark of Bago and it is the highest pagoda in Mon state with an elevation of 114 meter high, built over 2000 years ago; Shwethalyaung Reclining Buddha which is one of the most elegant reclining Buddha images stretching 55 meter long and 16 meter high and was built during the 9th century; the excavation site and restoration work at KanbawzaThadi which is noted for the famous palace of King Bayinnaung (1551 – 1581 AD); Four giant Buddha images in Kyaikpun Pagoda (28 meter high), built by King Damazedi in the 15th century. After Bago we drive to the Golden Rock, a sacred, massive gold-leafedboulderdelicatelybalancedontheedgeofacliffnearthetopof Mt. Kyaikhtiyo (1100 m) and is oneof themostreveredBuddhist shrines. Wewill arrive at the Kinpun “base camp”, the starting point of the road going onward to Kyaikhtiyo. We then have the truck ride, which lasts 45 minutes to reach the terminus of the road “Rathedaung”. From there on it is only 1 hour to climb on foot or by chair holders (to rent on site). Once at the pagoda you can enjoy a spectacular view, which is particularly beautiful at sunrise or sunset. Breakfast at the hotel. First we walk down to our transit place “Rathedaung” and then a truck ride to reach Kinpun base camp. After that we head to Taungoo, which was founded by King Mingyinyo in 1510 AD. It is one of the main ways to Bago-Yoma and its teak forests and is worth exploring. Upon arrival in Taungoo, you will visit of the town and surroundings. After breakfast at the hotel in the morning, you will drive from Taungoo to Kalaw, a charming hill station that is a center for hill tribes from the surrounding regions. Enjoy the many scenic landscapes. In the late afternoon, you will arrive in Kalaw and transfer to the hotel. Breakfast at the hotel. 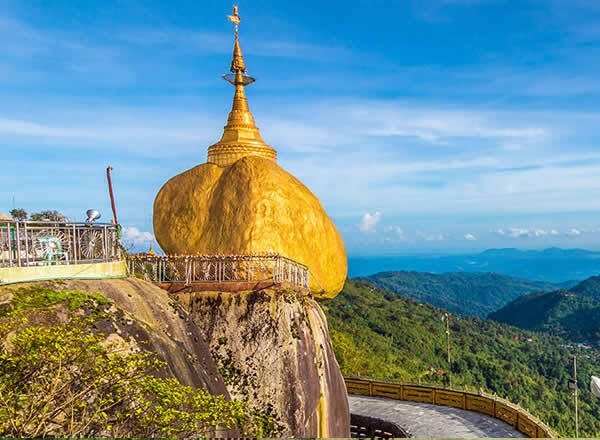 Drive from Kalaw to Pindaya exploring Shan paper making, basket weaving, and monk umbrella making workshops and the famous Pindaya Caves, which contain more than 8000 Buddha statues dating back hundreds of years. It is an astounding sight that has long beguiled Buddhist pilgrims and casual visitors alike. Breakfast at the hotel. 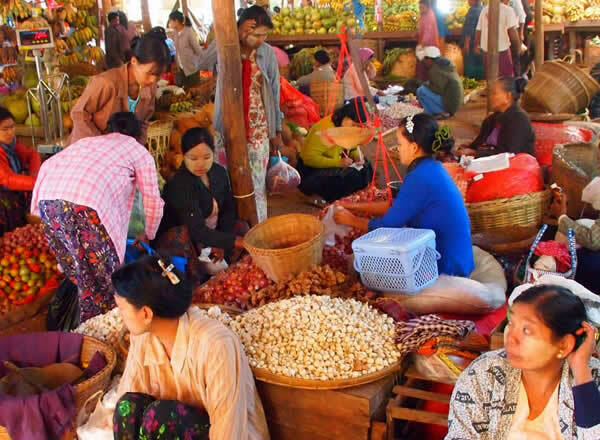 In the early morning you walk to the local market and buy all the provision for your forthcoming 2 day’s trekking tour. 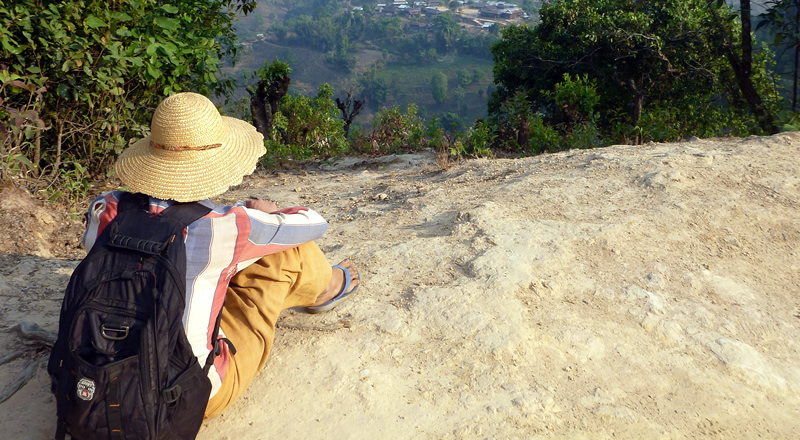 This morning you enjoy a walk through the hills for 1 hour to Htut Ni, village of the Danu tribe. You will pass through the farming fields where the Danu grows cheroot, tea, damsons and mangoes on the hillsides. The track crosses the valley floor before climbing very steeply again to another Danu village of See Kya Inn. Another 2 hours walk to Yasagyi, also a Danu village and here we stop for a simple lunch. In the afternoon we observe the tribal village life and how the Palaung people dry cheroot in a specially designed oven. Simple dinner (local cooking). Simple breakfast at the monastery. This morning our path leads through several other Shan villages producing Shan tea in the traditional way. You will see the drying of the tealeaves and pass through the tea plantations. From the hills are great views on the surrounding Shan Plateau. Pass through the Danu and Pa-O villages. Arrival in Pindaya around noon. Later we drive to NyaungShwe village, the starting point of the trip onto the Inle Lake, passing through breathtaking sceneries in many ways with great panoramic picturesque landscapes, Pa-O and Danu women in colorful traditional dresses and their ethnic villages. It is also famous for the Shwe Yan Pyay Monastery which is an elegant ancient monastery with its oval-shaped windows. 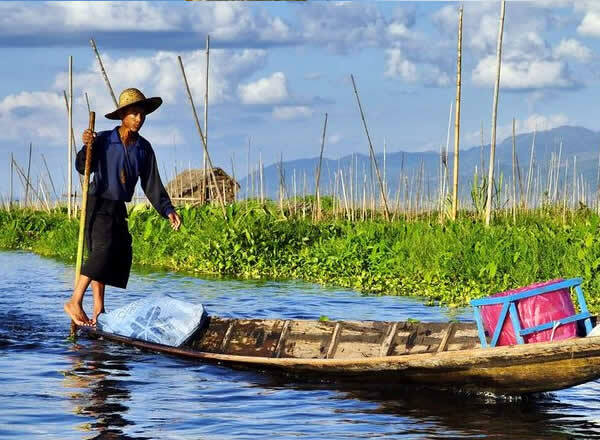 On arrival at NyaungShwe, a traditional long boat (motorized) will take you to the Inle Lake; the vast, beautiful and picturesque natural lake, 900 meters above sea-level, 22 km long and 10 km wide, which is one of the main tourist attractions in Myanmar. Breakfast at the hotel. Boat excursion includes: PhaungDawOo Pagoda, famous for its 800 years old Five Buddha statues which are enshrined in the center of the building; Ngaphekyaung Monastery, famous for its “Jumping Cats”; In Paw Khone village, well known for its silk weaving workshops, the technique and creation of the fascinating designs of the silk products. Return to the hotel at the end of the afternoon. Relax and enjoy your stay. Breakfast at the hotel. In the early morning, you will overland drive to Mandalay, which was founded in 1857-1860 as the capital by King Mindon and remained the capital until the dynasty of the Konboung, Myanmar’s last dynasty. In the late afternoon, you will arrive at Mandalay and transfer to the hotel. Breakfast at the hotel. In the morning you will be taken to the jetty for the boat trip to Mingun which is 11 km upriver from Mandalay on the western bank of the Ayeyarwaddy River. 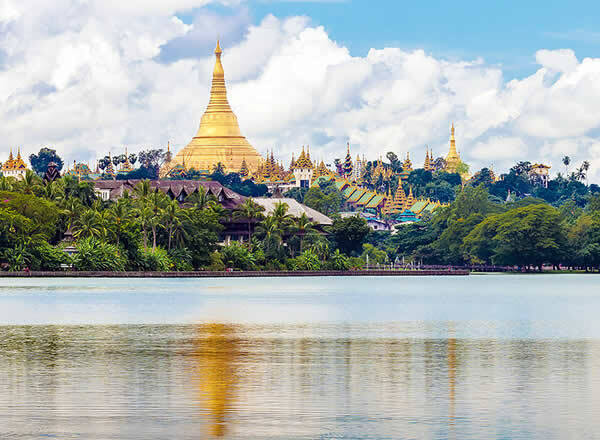 Mingun boat tour features: MingunPaya, a huge unfinished pagoda; Myatheindan Pagoda; a gigantic 90-ton bell, the largest uncracked ringing bell in the world. The 45 minute boat trip to Mingun is a very pleasant way to see the rural life along the Ayeyarwaddy River. After lunch time you will be exploring more about Mandalay: Mahamuni Buddha Image, the most revered Buddha image in Mandalay and a 4 meters high seated image casted in bronze; Craftsmen’s Quarters observing brasses molding works, stone and marble carvers, gold leaf pressing, tapestry workshop, cotton and silk textile weaving, silver smith workshop; Shwenandawkyaung or Golden Palace Monastery, a very magnificent building beautifully carved in wood, dating back to the 19th century. It is of great interest, not only as a fine example of a traditional Burmese wooden monastery, but also as a fragile reminder of the old Mandalay Palace; KuthodawPaya, the world’s largest book of 729 marble slabs inscribed the entire Tripitaka. In the evening you will be taken to Mandalay Hill, 230 meters in elevation. It is the natural landmark of Mandalay, a vantage-point for a full panoramic sunset view of the city. Breakfast at the hotel. 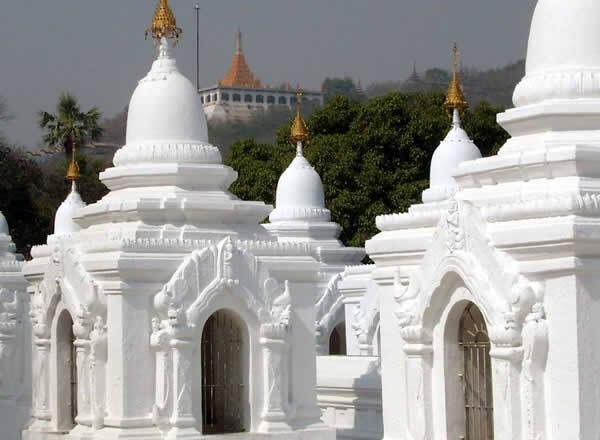 First we drive to the Sagaing hills crossing the Sagaing Bridge visiting the hills with its many stupas bleached with lime and its many monasteries. It is considered the largest religious center of the country where 3000 monks live and where you find not less than 100 operational meditation centers. After lunch transfer to Monywa, on the east bank of the Chindwin River. This city is the second large city of Upper Myanmar. 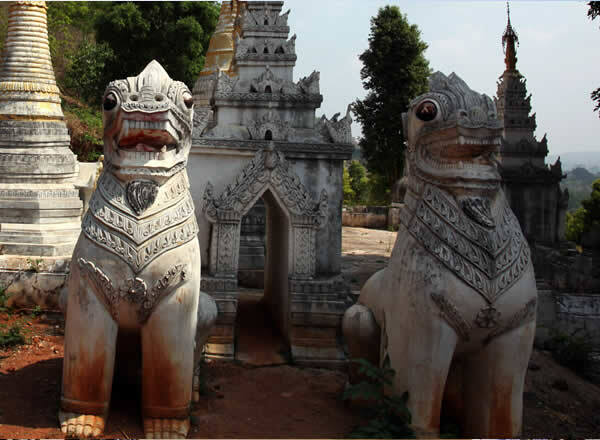 At 19 km southeast of Monywa lies one of the main attractions: Thanboddayis paying a visit to the Bodhi-ta-taungPagoda(one thousand Bo trees), KyaukaShwetharlyaung Reclining Buddha and a lacquer ware village. Breakfast at the hotel. You will drive overland by car to Pakokku (5 hours). You will cross a region with still very few tourists: the west bank of the Irrawaddy and its principle tributary, the Chindwin. Stop en route at Kya Su Gyin and Ma U Village housing two old pagodas. Transfer to the jetty in Pakkoku and boarding a cruise for a private room down the Irrawaddy River to Bagan (two or three hours navigation). You will arrive at Bagan in the late afternoon. 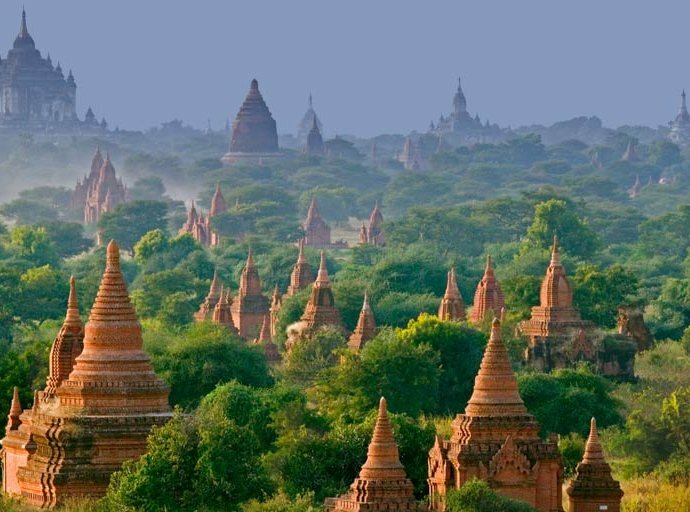 Bagan is one of the most remarkable archaeological sites in Asia. The 230 years from the 11th to the 13th century, when Bagan was the capital of Myanmar, were marked by religious fervor and the construction of thousands of stupas and temples. Transfer to the hotel and check-in. Breakfast at the hotel. Bagan’s pagoda tour: Bagan Archaeological Museum; Shwezigon Pagoda, built by King Anawrahta, a prototype of the later Myanmar stupas; Htilominlo Temple, well known for its old mural, fine plaster carving and glazed sandstone decoration; Anada Temple, one of the finest in architecture and most revered temples with its four standing Bagan styled Buddha images and huge carved teak doors; AnandaOakkyaung, a simple monastery built with red bricks located within the precincts of the Ananda Temple. It was built in 1137 AD and paintings of the 18th century are seen on the walls of the monastery; Thatbyinnyu Temple, 201 ft tall, the tallest in Bagan and it is shaped like a cross, but is not symmetrical. The temple has two primaries floors with the seated Buddha image located on the second floor; Dhammayangyi Temple, the widest temple in Bagan, and is built in a plan similar to that of Anada Temple. In the evening a horse-cart ride will take you among magnificent temples for about 2 hours. At the end you enjoy the memorable sunset over the world famous Archaeological complex from the upper terrace of one of the Bagan temples. Breakfast at the hotel. Today is free day and you can do your leisure activities of your choice (no services provided). Breakfast at the hotel. Transfer to Bagan’s airport for a flight to Yangon. Upon arrival in Yangon, you will transfer to the hotel and check-in. Your day in Yangon starts with Chauk Htat Gyi, a huge reclining Buddha image – housed in a large metal – roofed shed. The feet of Buddha wear a very readable with the 108 sacred marks. Definitely do not miss this colossal image. After that we go shopping to BogyokeAung San market (formerly Scott Market), where you can find a wide range of souvenirs, handicraft shops, gems and jewelry, famous for their qualities. Enjoy evening sunset at Botahtaung Pagoda, which is hollow type, like maize inside decorated with glass mosaic and it means the Pagoda guarded by one thousand vanguards. It is located on the river bank and close to the harbor, attracted by the pleasant atmosphere of the waterfront. You can visit Nathida Jetty and its surrounding to discover the daily working life of Myanmar People. Breakfast at the hotel. From Yangon to NgweSaung Beach, Myanmar’s latest beach resort, is a 5 hours drive. Its long stretch of purely fine crystal white sand and deep blue sea, shaded with thousands of coconut trees growing along the beach. The beach stretches 15 km along the coast with delightful palms swaying breeze from the Bay of Bengal. On the way you can visit the town of Pathein known for its colorful hand painted parasols. Arrival in NgweSaung Beach and spend peaceful evenings by watching the sun goes down and the stars come out over the Bay of Bengal while dining delicious seafood caught fresh from the ocean. Check-in at your hotel. Breakfast at the hotel. You will be leisure time enjoying sea, sun and sand. It’s also possible to go fishing, having a horseback ride and biking along the beautiful beach. Nearby are several fishing villages which can be visited by bicycle. 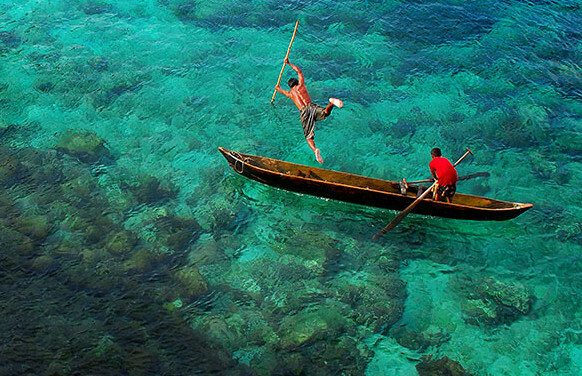 Fishing boats can be hired for trips to some of the islands off the coast or just for fishing at nearby reefs. Breakfast at the hotel. Check-out at the hotel. You will be picked up by our car and driven back to Yangon. Upon arrival in Yangon, you will transfer to the hotel. After breakfast at the hotel, you will be free time for relaxation or shopping. In the late afternoon, you will transfer to Yangon International Airport for your departure flight.